The range that not only stores your valuables but also stores your cherished memories. The handmade paper & cardboard jewelry boxes come to you in attractive designs and have all the functional features that are requisite in any jewelry box. 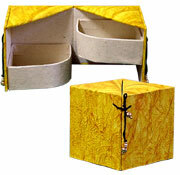 Mediums of priceless joy, these retail and wholesale jewelry boxes become a desirable gift item.